Two-thirds of all health care professionals got a flu vaccine last year, the Centers for Disease Control and Prevention announced in the Sept. 28 MMWR. Flu vaccination was most common among physicians (85.6%), followed by nurses (77.9%), and other health care professionals (62.8%). 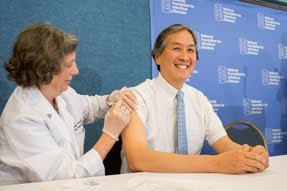 At a press conference announcing flu vaccinations for health care workers and the general public, Howard K. Koh, MD, FACP, received his vaccination in an effort to set the example. Dr. Koh, Assistant Secretary for Health at the U.S. Department of Health and Human Services reinforced the need for ongoing, collaborative efforts to improve influenza immunization. "I urge everyone to join me and get a flu vaccine this year," Dr. Koh said. Vaccination coverage was 76.9% among health care professionals working in hospitals, 67.7% among those in physician offices, and 52.4% among those in long-term care facilities. Physicians who worked in hospitals received the vaccine at a rate of 86.7%, compared to other health care professionals who worked in long-term care facilities (50.2%). At hospitals that required influenza vaccination, coverage among health cre professionals was 95.2%. At hospitals not requiring vaccination, coverage was 68.2%. Among the third of health care professionals overall who did not get vaccinated, three most common reasons were a belief that they did not need it (28.1%), a concern about vaccination effectiveness (26.4%) and a concern about side effects (25.1%).